Powered by (6) "D" size batteries, making it ideal for portable use or for use in environments in which power may be unreliable. 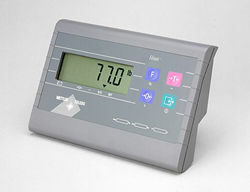 The display features six-digit, 25 mm (1 in) high characters and is backlit, making it easy to read. RS-232 port for sending data to a computer, printer, or other serial device.